Louis Renault was born in Paris in 1877and looked set to follow in his fathers footsteps as a button manufacturer. Instead, he turned is hand to cars and built a Single cylinder De Dion engine powered prototype with shaft transmission, as opposed to the more fashionable chain drive. Intended for his own pleasure it aroused much interest among his friends, who ordered replicas. Renault set up Renault Freres in March 1899 with 40,000 francs capital put up by his brothers. The car when displayed at the Paris Automobile Salon in June brought in 60 orders. Renault was then able to set up a factory and 179 cars were made in 1900, the first full year of production. Later the little De Dion engine was replaced by a 450 cc unit. Renault realised the value of race success and a Renault put in the best performance in the 1899 Paris - Trouville race. Other successes included an outright win by his brother Marcel in the 1902 Paris - Vienna race. Louis withdrew from racing after his brother was killed in the 1903 Paris - Madrid race, but the company later returned to racing and won the first ever l’ACF Grand Prix in 1906. Built in the mid 1990’s from one of Pyro’s “Brass” range of kits, several of which feature in the museum, this model is primarily built straight from the box. 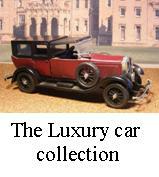 A few details have been added such as the Mesh in the top luggage rack and the use of bare metal foil on the bonnet. Painted with Halfords acrylic car spray paints, and detail painted with Humbrol enamels, the pin stripe lining had to be applied by brush. The interior picture below shows the use of dry brushing to give the seats some depth and reality.